Monday’s topic of the day from the Daily Post is a particularly loaded one. “What is the worst teacher you have ever had?” Rather than focusing on teacher from the many candidates, I will focus one some common traits. Note if you know me please do not identify any teacher mentioned by name. One trait of a bad teacher is an unwillingness to adapt or change to meet the needs of students. One problem I often encountered was teachers who had been teaching the same subject or grade the same way and refused to change. Students who could fit their mold of a perfect student were successful. However students who couldn’t meet their standards were singled out for “extra” torture to change behaviors or teach a lesson. One year I had a teacher who insisted that all handwriting papers had to be perfect. Until those papers were perfect they had to be redone. According to her faulty logic perfect handwriting was necessary for success. She failed to understand that I have dysgraphia and forcing me to re-write every handwriting page each week was not going to help. Further, I also have ADHD so keeping me inside every day instead of allowing me to have recess only caused more problems. Creating, fostering or encouraging an environment that promotes bullying. 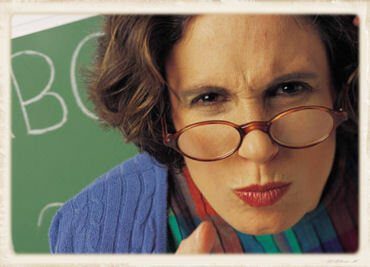 These teachers usually have one or more student who is the class scapegoat. This child often has a learning problem or other issues that cause the child to be visibly different from others. The teacher may not always actively participate in teasing or torture of the “scapegoat”. Many times it may just be the way the child is treated. In my case, I had a teacher who called me dummy and allowed/encouraged other students to torture me. Focusing only on the trivial things without seeing the big picture. These are teachers that believe a child must spell every word correctly in a 4th grade speller or the child will not be successful. I actually had a co-worker tell me that if a student couldn’t tie their shoe by the end of kindergarten the child should be retained. I had one teacher who refused to grade any work that had more than 3 scratch outs. She felt that if I re-wrote enough papers I would stop being messy. What I learned was that I hated writing. She missed the big picture that I was actually creative and a decent writer. Remember if you know me please do not identify any teacher mentioned by name. I’ve had a few shockers which I have written about in a recent post on my blog.